Canavan disease is one of a group of genetic disorders called leukodystrophies that result in defects in the myelin sheath that covers nerve cells in the brain. In Canavan disease, a ​genetic mutation on chromosome 17 causes a deficiency of an enzyme called aspartoacylase. 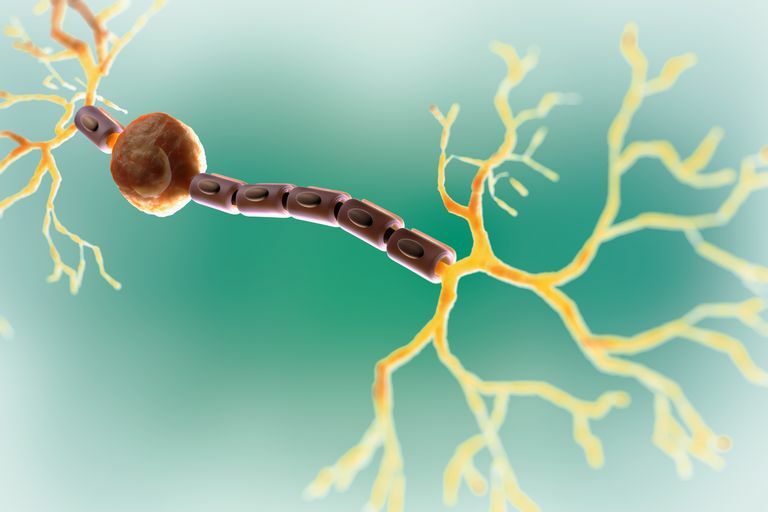 Without this enzyme, a chemical imbalance occurs that causes the destruction of myelin in the brain. This causes healthy brain tissue to degenerate into spongy tissue full of microscopic fluid-filled spaces. Canavan disease is inherited in an autosomal recessive pattern, meaning that a child must inherit one copy of the mutated gene from each parent in order to develop the disease. Although Canavan disease may occur in any ethnic group, it occurs more frequently among Ashkenazi Jews from Poland, Lithuania, and western Russia, and among Saudi Arabians. If an infant's symptoms suggest Canavan disease, several tests can be done to confirm the diagnosis. A computed tomography (CT) scan or magnetic resonance imaging (MRI) of the brain will look for the degeneration of the brain tissue. Blood tests can be done to screen for the missing enzyme or to look for the genetic mutation that causes the disease. There is no cure for Canavan disease, so treatment focuses on managing the symptoms. Physical, occupational, and speech therapy can help a child reach his or her developmental potential. Because Canavan disease gets progressively worse, many children die at a young age (before age 4), although some may survive into their teens and twenties. In 1998, the American College of Obstetricians and Gynecologists adopted a position statement recommending that physicians offer carrier testing for Canavan disease to all individuals of Ashkenazi Jewish background. A carrier has one copy of the gene mutation, so he or she does not develop the disease but can pass the gene mutation on to children. It is estimated that 1 in 40 people in the Ashkenazi Jewish population carries the gene mutation for Canavan disease. It is recommended that couples at risk for carrying the mutated gene be tested prior to conceiving a baby. If the test results show that both parents are carriers, a genetic counselor can provide more information about the risk of having a baby with Canavan disease. Many Jewish organizations offer genetic testing for Canavan disease and other rare disorders in the United States, Canada, and Israel. "Canavan Disease." Disorders A - Z. 2 July 2008. National Organization for Neurological Disorders and Stroke. "Canavan Disease." Types of Leukodystrophy. 2 Aug 2007. United Leukodystrophy Foundation. "What Is Canavan Disease?" The Diseases. National-Tay Sachs & Allied Diseases Association.